My homeschooling journey started 10 years ago, when I could not bear to send my oldest child away for a full day of kindergarten. I was blessed to be introduced to homeschooling by a fellow ballet mom, who told me about The Well-Trained Mind . From there, I found my way to the WTM forums, where I made some wonderful homeschooling friends. Those wonderful ladies (and a few gentlemen) helped me learn how to teach my children, as well as what I could reasonably expect from them (note - NOT that they would be independently working at the age of 5). They also helped me become a better parent, and I will be forever grateful for that. However, as I tried implementing neo-classical homeschooling, something wasn't quite right. There was a lot that was excellent - the living books, of course, and more, but something was missing. I was tremendously blessed to be introduced to Charlotte Mason by some local moms, who had a small family co-op we were able to attend, and it changed our lives for the better. I have been trying to learn more about Charlotte Mason's principles ever since, and while I still feel like a newbie in some respects, I can't imagine educating myself or my children in any other way. As Charlotte Mason herself said, "Education is an atmosphere, a discipline, a life." One thing I've learned is that Charlotte Mason was, in fact, a classical educator. She did some things quite differently than many classical educators do these days, but her methods and principles are firmly founded in the classical tradition. It's hard for me to explain that to other people, though. 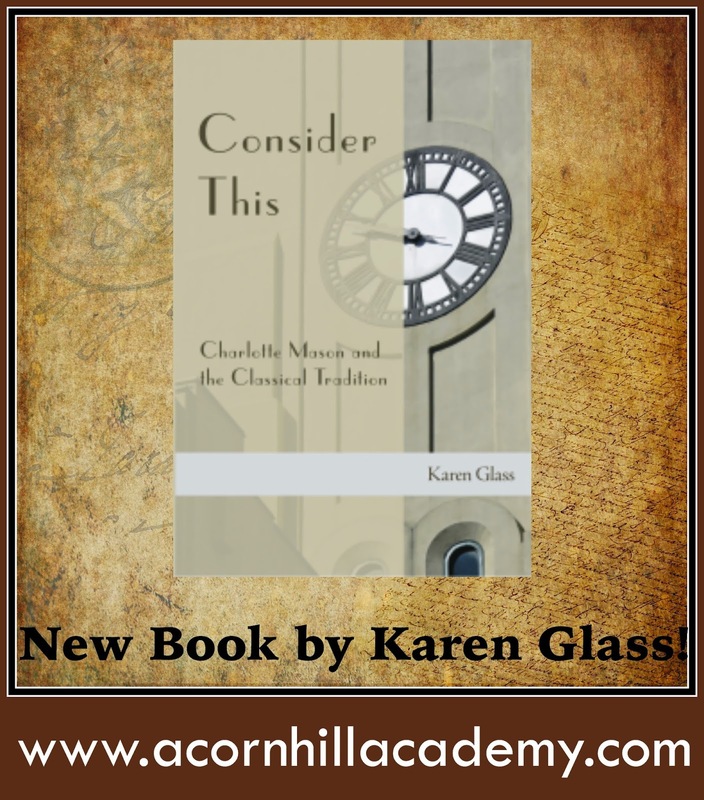 I am SO EXCITED to be able to share with you Karen Glass' new book, Consider This: Charlotte Mason and the Classical Tradition . I have been waiting and waiting for this book to be released, and it's finally here! I ordered my copy today, and the best part? Through the Amazon Match program, if you purchase a paperback copy you can get the Kindle version FREE, so I can start reading today! I cannot express to you how happy this makes me. Also, through October 31, 2014, you can download Karen's study guide for the book for FREE. Karen Glass is a member of the Ambleside Online Advisory, and has taught her children, ages 10 to 24, using Charlotte Mason's principles from the beginning. I first read the article she wrote for Susan Wise Bauer's website, The Well-Trained Mind, and appreciated her wisdom. She has been researching CM for 20 years, and I can't wait to read what she has to say in her book. Karen's book is more than enough on its own, but the introduction was written by David Hicks, author of Norms and Nobility: A Treatise on Education , a wonderful book on classical education and one that the Ambleside Online Advisory used in putting together their wonderful curriculum. Here's the book trailer video. Enjoy, and then head over and order your copy of Consider This! Yippee!! Kindle version for the late night reads! So happy!! !